Immediately after this wedding at King Edward Hotel, we took a few photos indoors. The bride and groom chose the library on the main floor for family photos. Afterwards, we took a few shots on the main staircase, and between the columns of the Palm Court. Despite its undisputed beauty, the hotel is always busy and it is often difficult to get a clean shot of the bride and groom during the day. If you get married at King Edward Hotel, please budget extra time for interruptions. Another popular spot for wedding photography is the awning on the east side of the hotel. I was asked repeatedly to re-create the shot below. The final picture of the day was that of the bride and groom kissing in front of the King Edward Hotel main entrance. In this image, shot with a 35mm 1.4 lens, we see that all the lines converge towards the bride and groom. 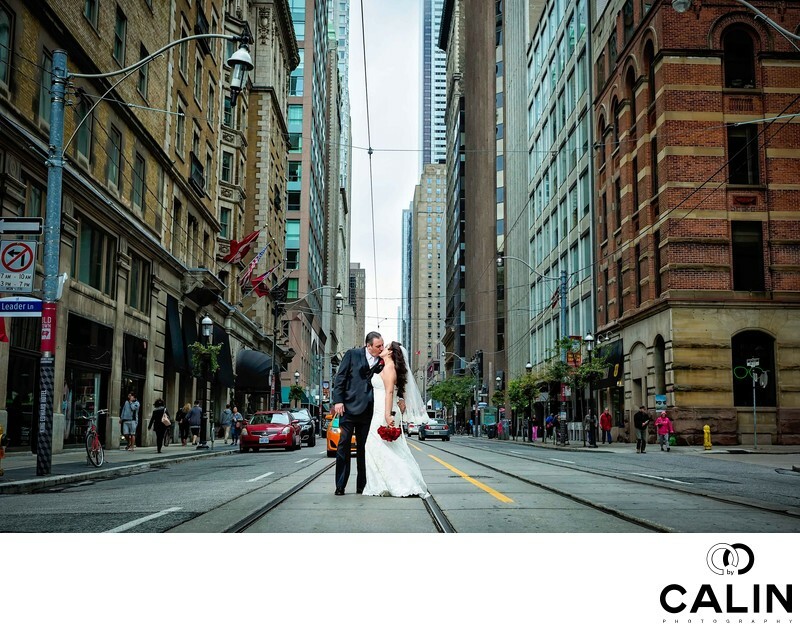 To create this beautiful wedding photo I dropped on the ground in the middle of the street, praying that no car hits me. The bride and groom literally stop the traffic so that we can get this shot. For this image I selected the central composition. The bride and groom's heads are placed at the intersection of the sinister and baroque diagonals, which gives the image feel of stability. This photograph is a visual metaphor for a long, happy and stable marriage. Besides the composition, what makes this image unique is the dramatic pose of the bride and groom locked into a kiss while the rest of the world keeps moving around them.